Every life has a beginning, middle and end but they have only a beginning. They are alive like you and me but unlike us, they are waiting for death in a lonely island off Batticaloa. If possible, visit them one day. By the time we passed Kallady Bridge, the fishermen had returned with crabs and prawns in the morning after a night of fishing. They were having the breakfast of Ulundu Wade and Idly with Sambaru and drinking the morning milk. They were cordial to share their breakfast with us. We were from Colombo to visit Manthivu Island. When I said it, their mouths were agape with astonishment. I suspected if they had not understood what I said. “We have never gone there. Nobody visited that island. Our people do not like even to fish around that island. Now there are people who go there. You have to inquire at the lagoon you see after passing the Manthivu Bridge”, one fisherman said. He instructed us to go to the hospital directly and meet the Chief Medical Officer of Batticaloa Teaching Hospital. When we went there, the time was around 8 a.m. We had to wait for a responsible person and took the phone number of the Hospital Director. When we phoned him up, he said he was going out and advised us to meet his deputy. The Deputy Director of Batticaloa Hospital arrived at 8:31 a.m. She asked me to submit a letter of request to grant the permission to visit Manthivu Hospital. “Son, this is the first time during my administration a journalist visits Manthivu Hospital”, she said. She endorsed the letter and directed us to the Chief Secretary of the Hospital. “Our boat goes at 8:30 a.m. and returns with staff. Again, we take food to the patients at 12 noon and return at 2:30 p.m. We go back there at 5 p.m. with food and return with staff. I have informed them about you. Hurry up and board the boat. The boatmen will help you”, the Chief Secretary instructed. The boat was launched from the shore of the lagoon. Soon, the Manthivu Island was enlarging before our eyes The island was surrounded by mangroves. Boat’s hum alarmed the birds perching on the trees. No fishing boat was in the vicinity. “Fishermen have not been fishing here since a long time. In the past, most of the patients were deformed people. They tried to take to boats to escape from the island. Therefore, the white Government Agent Antonio banned fishing around the island. Now the fishermen do not go there because of the fear of leprosy”, the boatman said. The name board on which the words ‘Manthivu Hospital Premises attached to Batticaloa Teaching Hospital’ was leaning towards the lagoon due to corrosion in the post that held it upright. The boat was halted near a pier made of old tyres. A group of pleasant staff members of the hospital took us there. The hospital was about a kilometer away from the shore. The staff asked us to walk carefully in the middle of the footpath. The island was covered with unknown vegetation. Mana koka, a kind of storks were perching on the trees. Big bats were also hanging in some trees; a couple of peacocks walked away from us peacefully. The island was like a paradise but how many people may have died there lonely and buried without seen by their kith and kin. In a corner of the island, a housing complex was being taken over by the wilderness. “We gave those houses to the patients who were quite better. They grew vegetables in the garden and cooked their own food with dry rations provided. Their disease worsened suddenly and they died. It was the nature of this disease. Now, no one will come to live in those houses”, our guide, the hospital employee said. The houses have been built according to colonial architectural design and in front of each house there was a plot of land for cultivation. Some houses have perished now. Beyond the housing complex, a temple was in ruins. The shrine and the lodging of the monks were empty. The belfry had no bell. Only the statue of Lord Buddha was intact. In front of the temple, the church had gone to the wilderness with the statues of saints and the large hall. The mosque has completely gone to the jungle. Austin Woodeson. 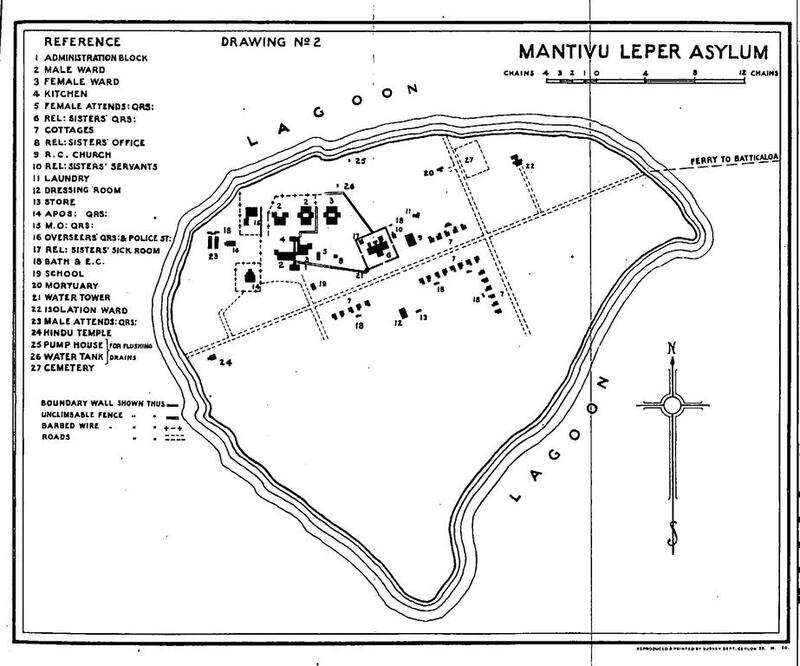 Mantivu Leper Asylum, Batticaloa, Ceylon. Transactions of the Engineering Association of Ceylon. 1930. “Twenty years ago, the shrines of all three religions were functioning. Mosque was first abandoned. Around three or four years ago, Buddhist and Catholic priests visited the shrines once a week. Now they do not visit. We maintain the hospital amidst a lot of difficulties”, the hospital employees said. The administrative building of the hospital is a mix of Dutch and English architecture. The tall roofs made of large timber beams are covered with old style roof tiles. Massive arches gave a grand look to the buildings but they have become lodgings for bats due to neglect. The staff is trying to provide maximum comfort with the meager sources available. The hospital has only two patients. They were in the ward in one corner of the island. The wards are partitioned as rooms for the patients’ privacy. Although the wards were old, they were clean. There are signs of housing large number of patients and staff in the past. The two patients are in the ward in the centre. Their physical belongings were limited only to a small bag of clothes and plastic bottles. But they have hearts bent towards the outside world. They are living with death in their hands. But they were lovable men and I felt it was a great pleasure to meet them. 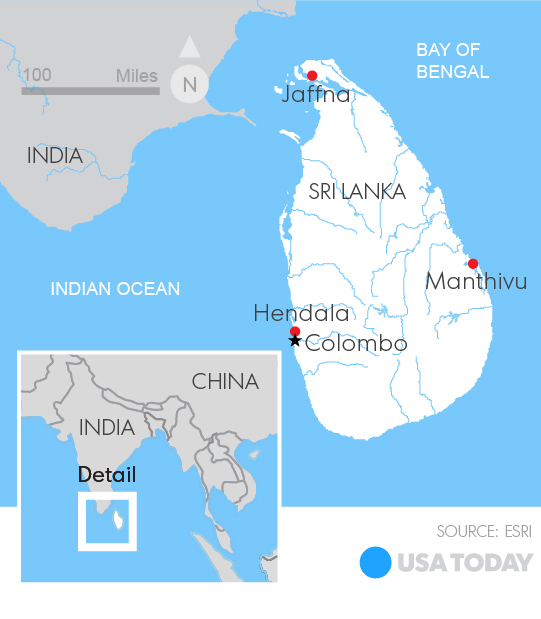 Maiyadasa (not the real name) is from Jaffna. He does not remember his childhood now. I line up here the fragmented memory he recalled with beaming eyes turned towards the sea. “My parents were from Jaffna. I had a brother and a sister. We went to school. The priest of the church diagnosed my disease. My mother did not believe. The situation in the house changed. I was separated. The disease emerged in my legs and three toes dropped. “Then my father said I could no further be kept at home. I was taken to Jaffna Hospital and I was transferred to here. It was long ago. There were a lot of patients then. There were a lot of Tamils. I had Sinhala friends. Some grew vegetables in their gardens. No one left this island. They died one by one and they were buried in the cemetery over there after prayers conducted by the Christian priest. “My family never visited me. Parents may be still alive. They don’t know where I am. I cannot visit them. I received letters from Jaffna in the past. I don’t remember who sent them. Now nobody writes to me. All toes of my feet have dropped. I have to wear shoes to walk. Now the wounds in the hands are cured. Wounds in the body are less. Doctors advised me to wear a sarong but I was not used to it. I wore trousers. My father sewed my first pair of trousers. “We are treated kindly. The animals that live in this island are so tame they come near us. We were sorry when one died. On those days we did not eat. Now I have understood that all of us have to die. Patients come to this hospital very rarely. “Many people are afraid of the leprosy patients. Even the priests do not visit the temple and the church now. In the past, when they came we went to both church and temple. I remember Christmas time when we sang hymns. Wijesiri (not the real name) is from Galle but he has no proper identity. “My younger brother took me here a long time ago. Then I was about 20 years old. I was having herbal medicine for a skin disease and diagnosed for leprosy when the toes dropped. I live here since then. Many people who lived here died. Those who come here never go back. “Then I was brought in a canoe. The pier was on the other side. It was brought to this side after motor boats were introduced. “Food is brought to us by boats. We are given bread for breakfast and rice for the lunch and dinner. “I care my wounds. They are not painful although they are big. The wounds in the fingers were cured. I can touch with them now. Now I have half of my leg and difficult to walk. It is quite difficult to climb on to the bed. “I don’t know the date. In the past, the Buddhist monk came to the temple. It is now gone to the jungle. We received letters from the post office in the past but I have not received a letter for a long time now. “My brother may be living in Galle. He has children. They cannot visit me. People are afraid of the disease. “Nobody visits us. We have very old equipment. We have solace because animals and birds like peacocks are very friendly with us. Lots of water snakes live in the island and I am afraid of them. They do not come to the ward due to the smell of medicine. Marwaan Macan-Markar. In Forgotten Isle, Lepers Live with Stigma. IPS News. 1999.